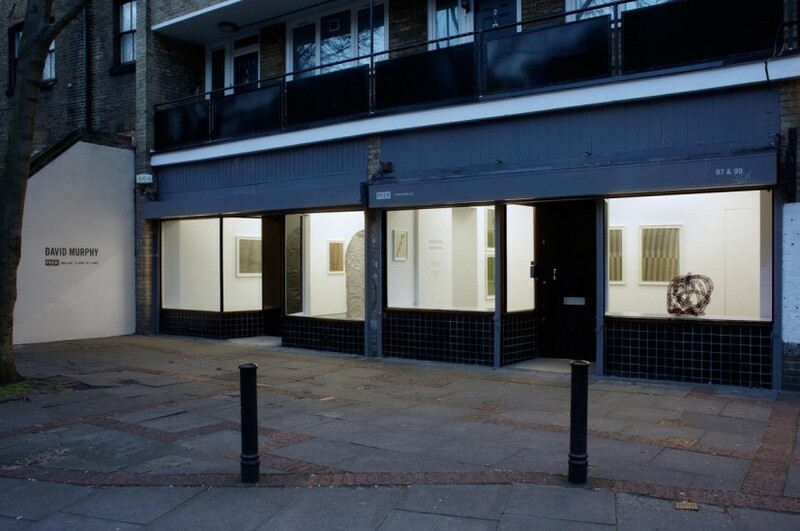 This week I am sending you to Hoxton Street, and to the redoubtable PEER, an institution which has been an important, critically independent voice on the London scene since 1997. 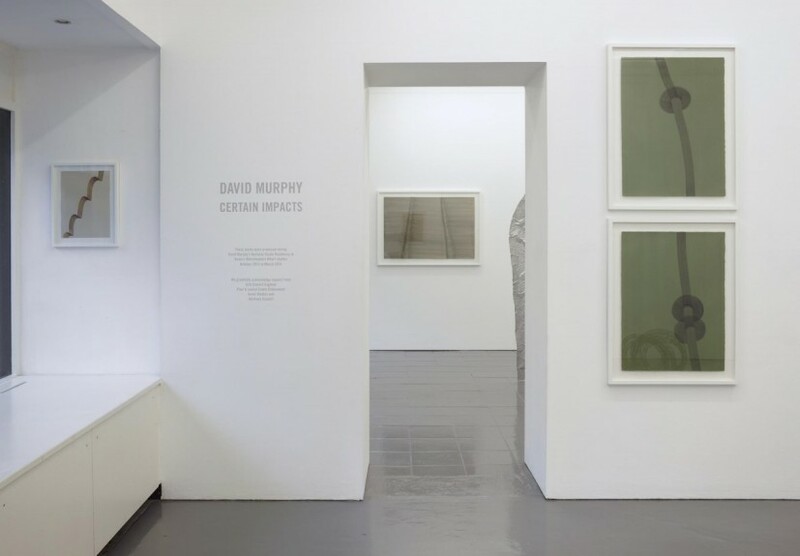 Currently showing there is a young artist called David Murphy, with a wonderfully elegant and sophisticated group of drawings and sculpture, all made during an 18-month residency at Acme Studios. Born in Newcastle and trained at the Glasgow School of Art, Murphy’s concerns are a world away from the post-internet, conceptual or political focus of other artists of his generation. Neither is this work that one might necessarily identify with the Glasgow scene of recent years. Instead what we have here is an acute engagement with material, with gesture and strategies for mark making. 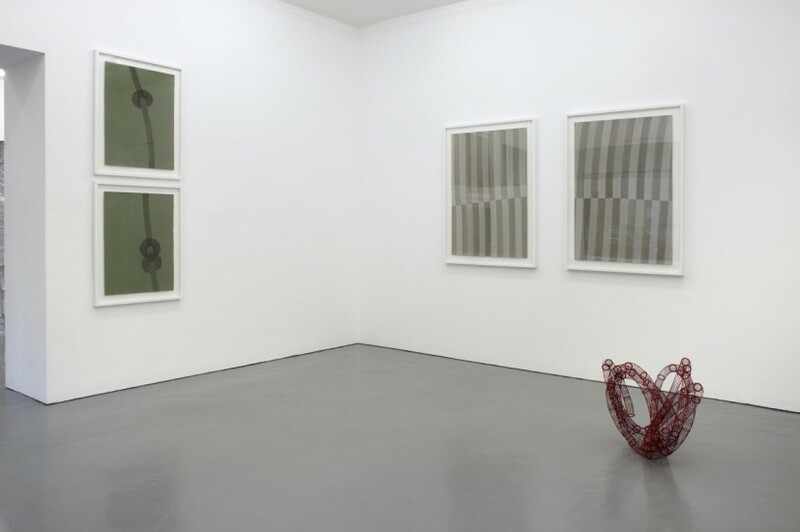 In the first space are two related sculptures – knot-like forms, created from fine wire and laser-cut washers. One sits in the window, the other is poised lightly on the floor behind. Painted a matt rust red that recalls roughly primed metal of a speculators new build, these forms visually embody the tension inherent in sprung metal twisted and turned in on itself. The process of making them involves creating long, tube-like forms that the artist then manipulates by hand and finally spot-welds to create a stable structure. It is a gestural, performative process, that connects with the works on paper that line the walls. The paintings on paper here are not preparatory to the sculpture but a practice that exists in parallel to it. 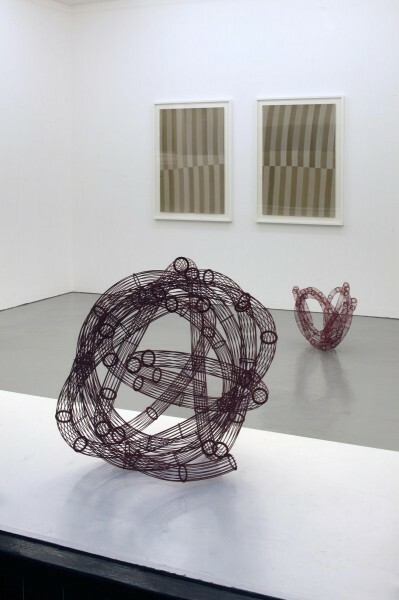 Murphy uses milk-based casseine paint for it’s dryly controllable nature, creating skeins of painted gestures that connect to the fine forms of the wire sculptures but also take the mind in the direction of textiles too. In greyscale tones, the most developed of these paintings blur the distinction between two and three dimensional form by creating optical topographies; the artist has spoken about his understanding of textile as a three-dimensional medium rather than something inherently flat. 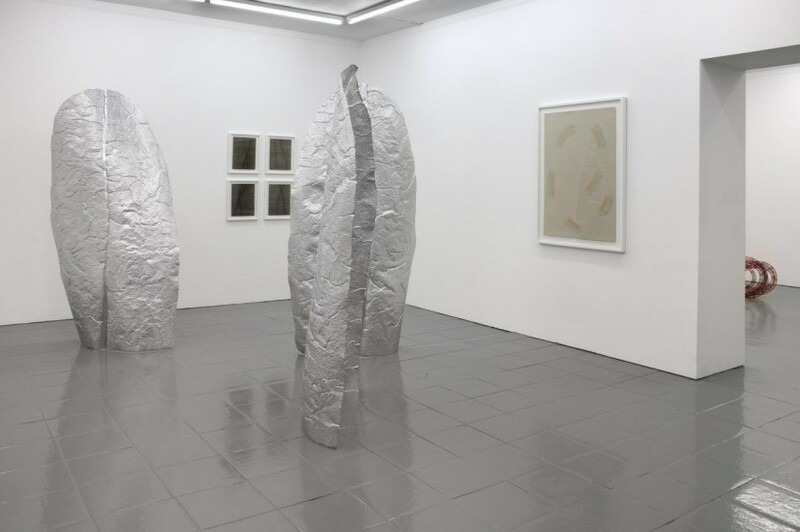 In the second room a large work in three parts confronts you with what are undoubtedly organic forms, but forms which defy quick identification. 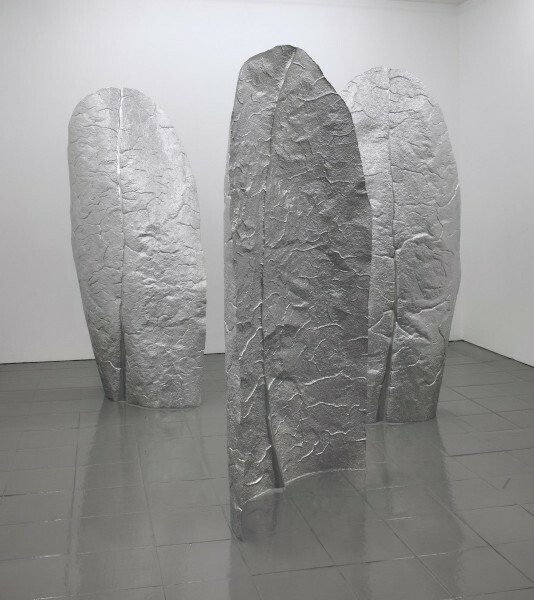 In fact the free-standing, six-foot aluminium sculptures owe their form entirely to the process of fabrication. 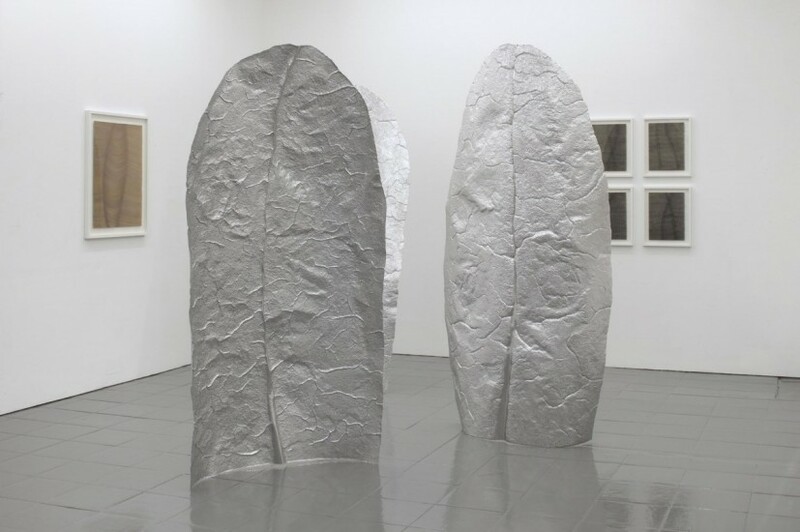 Over many hours the artist punched the surface with fine-pointed tools which caused the metal itself to stretch, producing vein-like structures to develop in the process. This is fine and subtle work, and Murphy is definitely one to watch in coming years. PEER has an extremely beautiful edition by the artist, in fact each one is a unique paint collage, which will get you in on the ground floor with this artist, if you want to put something new and exciting on your wall. P.S. Due to the holidays my next Friday Dispatch will be on 25 April.